What defines Walden? and Thoreau? The pond itself. What delineates the edge of the pond? The topography of the land and the surrounding area. In other words, the lake itself, as the embodiment of past and present, is dictated by the height of the hills and valleys that converge at the land/water horizon. Walden Pond speaks to the silence of the site, and the absence of Thoreau. More importantly, perhaps, is that it most closely relates to the memory of Thoreau. Whereas with the land, the terrain is endless. Walden isn't delineated by the land undecipherable from any one vantage point, as if an arbitrary marker on a map. The lake is delineated within the earth itself - its edges marked by the land/water horizon created via topography. Thus, to think of Thoreau is not to think of a memorial spot on land, but the lake itself. Walden Pond itself manifests this memory. An aperture into time. What is it about the project, siting, and theoretical framing that you wish to accomplish or heighten with the aperture? 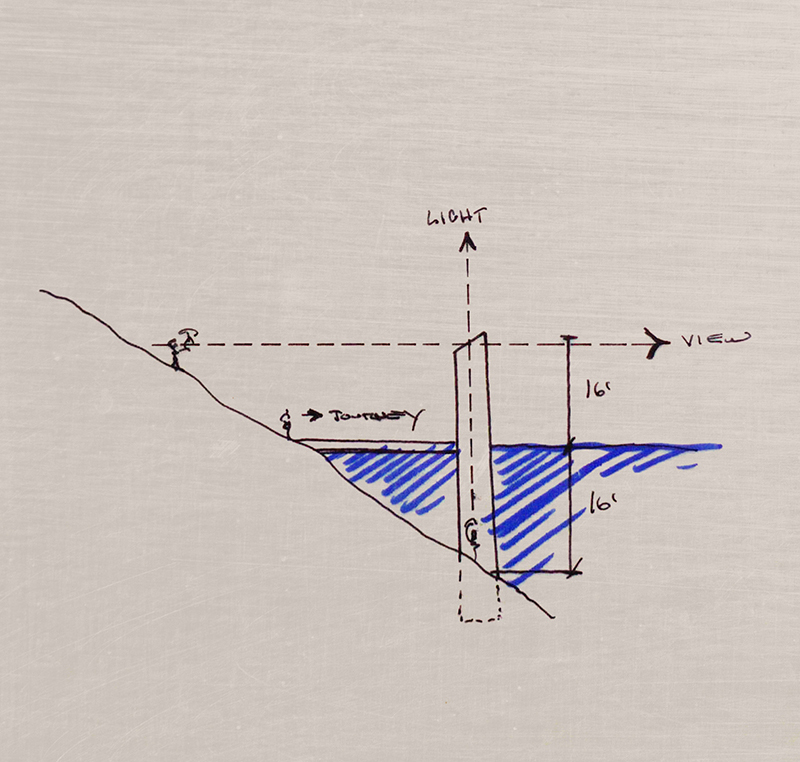 The topography of the land and the delineating element of the edge of the pond. If the pond is what trumps land, manifesting the memory as embodiment of theoreau, then its edge condition - as a response to the height and topography of the land - is what informs the siting of the bridge and aperture. The aperture heightens the theoretical framing of Thoreau through topography. Focus on what it means for it to be liminal. Keep it limited to the notion that an aperture here is one into the past. Is it the light, and the evocation as making visible that which cannot be seen (as apertures do). I began working again with the bridge as object manifest, and not the morphology of the chamber space. The bridge is really the liminal element. The aperture must serve to reinforce and emphasize this event of liminality as a temporal memory of Thoreua manifest in a chamber to light. There need not be a view associated with the aperture, or if there is one, it need be on the journey to the aperture. The entire lake is a view, an amazing panarama, the pathways around the lake frame views. This aperture, thus, is a purposful obfuscation of the view - or rather a reduction of the view to mere light - to heighten ones awareness of self while blurring ones awareness of time.